This guitar workbook covers every aspect of bluegrass playing, from simple accompaniment to advanced instrumentals. 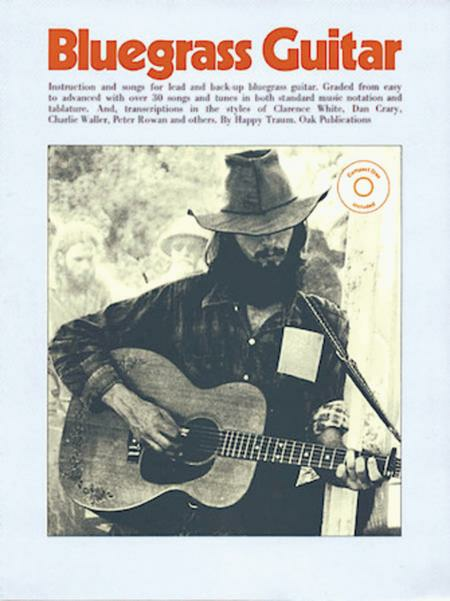 Over 30 bluegrass and traditional songs are included in the styles of Clarence White, Dan Crary, Charlie Waller, Peter Rowan, and others. The tunes are graded from easy to advanced in both standard music notation and tablature. Includes photos and a CD. its quality and value to a student. Happy has picked some accessible "standards" and written some great TAB's for them. He also has some eclectic, "hot" tunes to whet your whistle and give you inspiration. All tunes are within the range of any early Intermediate player, in my opinion. I love this book and think it will not disappoint any starting on the flat-pickers highway. Enjoy, as I have. 40 of 75 people found this review helpful.